PHOTO BY JACOB GURNEY Tiffin City Council Chamber after its recent renovations. Tiffin City Council is to hold its first meeting in the Tiffin City Council chamber since renovations were completed. 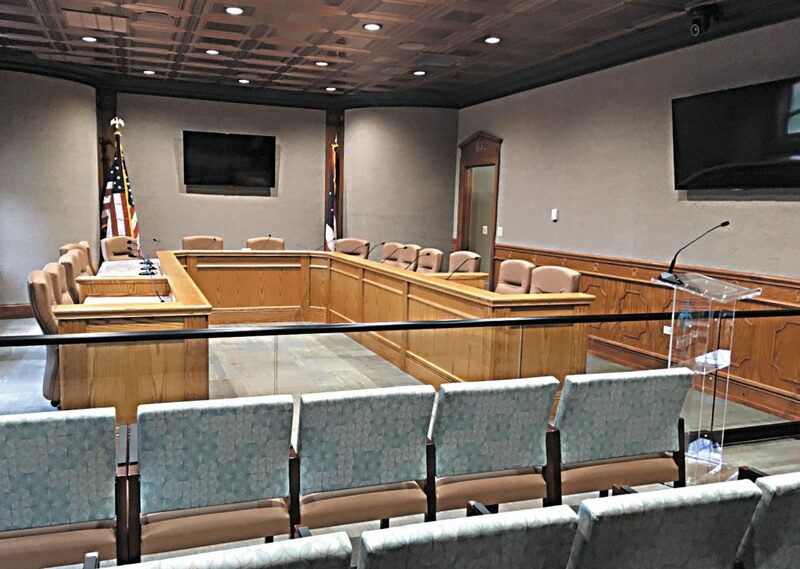 City Administrator Dale Thornton said everything was stripped down to the bare walls and construction crews added new carpeting, a conference table, tempered glass, four new video displays, solar panels for the windows and new ceiling and lights. He said the renovation was needed because the room didn’t function well and council never had a permanent home. “When the municipal court moved out to the (Seneca County) Justice Center, it allowed us to create a permanent home for city council,” Thornton said. Renovations in the council chamber cost about $60,000, he said. It was estimated that renovations would cost about $140,000, but by using mostly Tiffin Public Works Department employees to do the renovations, they were able to save over $80,000. Thornton said during the winter, Public Works and Tiffin Park and Recreation Department employees are often less busy with outdoor projects, so they can pull them inside to do work, which helps save the city money. Additionally, they tried to get materials from businesses in town, he said. The new audio/visual system and new microphone system was estimated to cost $90,000, but it only cost about $45,000 because it was purchased from Sound Solutions of Ohio, Thornton said. Additionally, he said, Lee’s Floor Covering did the flooring; the rails and tempered glass came from Tiffin Glass & Mirror; and the ceiling and recessed lighting came from Lowe’s. Thornton said Tom Lonsway built the wooden council conference table and he did it to match the walls. “He did a great job of making it fit the room,” he said. The only aspect not purchased locally were the chairs which were bought from a Findlay company, he said. “It pretty much was all done with the help of local merchants,” Thornton said. Tiffin City Council President Mark Hayes said by using local contractors when they could as well as employees from Tiffin Public Works Department and Tiffin Park and Rec Department “definitely helped” save money. Thornton said he thinks the renovations will be beneficial to council and the public. He said all the cords that were on the floor are gone so they eliminated a tripping hazard and the seating is more comfortable for people since they replaced the old wooden benches with chairs. Hayes said he thinks the renovated chamber is going to be more citizen friendly. He said he thinks at times, citizens were somewhat intimidated by the old setup, especially with him, since he sat up higher where he was kind of looking down at people. Additionally, the former microphone system went out only to Spectrum and sometimes people in the back had a hard time hearing, Thornton said. The new equipment will make meetings more audible and they also now have assisted listening devices available to amplify the sound and help people hear better, he said. Hayes said when they had powerpoint or video presentations people often had a problem seeing, now, that’s not a problem. He said that he is surprised by how many people watch the council meetings on television and a common complaint has been not being able to hear what is being said on television. He said if the public will provide them with any feedback in regards to the quality of the video and sound, they would welcome their comments. “It was a bigger issue and the key thing is communication because if (people) can’t hear, then they can’t be a part of the process,” Hayes said. Thornton said with the new televisions they will be able to do video conferencing in there so whether a person is in Columbus or Cleveland or another state, a presenter can appear and have a video conference where they can be present without having to drive or fly here. “I think the ability to display things visually on the screen will make it more attractive to anyone that presents here,” he said. Thornton said its important to have permanent spaces for council so they no longer have to worry about setting up tables or bringing in refreshments. “It will all be permanent here and ready to go so (council) can just concentrate on legislative work and not on the logistics of setting up for a meeting,” Thornton said. “They were very gracious hosts and I really appreciate that,” he said. Hayes said the renovated chamber is something that all the citizens ought to come up and see when they get a chance just to see it because it was their tax dollars that were invested. The first council meeting in the new Tiffin City Council chamber room is to take place at 7:30 p.m. tonight.